I’m having a flash back to the times when Mom would try to get just a few more months out of pants I had outgrown…. They took our souls and gave us these flip flops. I’d like to discuss her leather bandaid top, but I can’t get past the weird creepy optical illusion of her feet- are they on backward? There was one doll that was even lonelier than Edith. IS the one on the left actually curling her lip in disgust?? Ok, so maybe you can be unhappy while thinking about llamas. I stand corrected and shocked. By all that’s wearable, these are hideous beyond belief! Why the vile plank-like footwear? Why have dangly fringes lurking underfoot waiting to break your neck as soon as you move? Why has navy blue bobble-dolly got her vest/babygro hanging down under her skirt? I understand the look of misery on their faces. Feeling queasy. 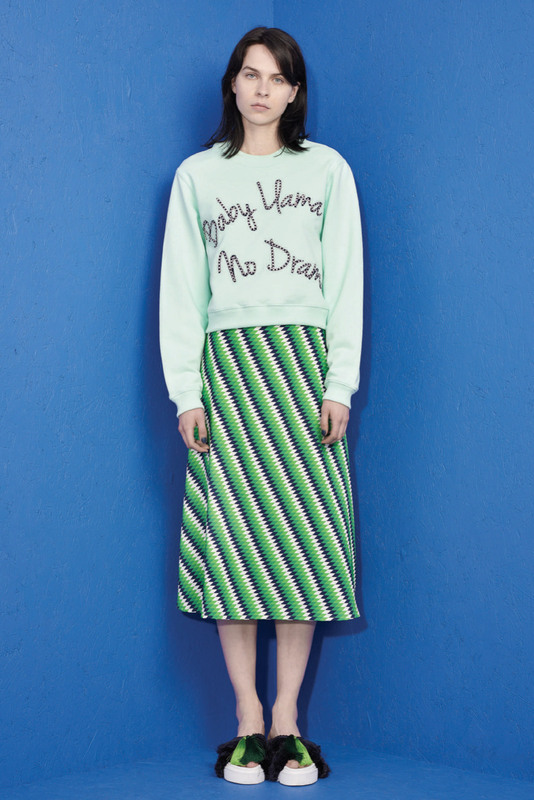 House of Holland used to be like Betsey Johnsonfor me- crZy fun with some cullable pieces- now it’s just home ex ugly!? That model was not thinking about Llamas! There’s no way to even say the word without a smile crossing your face. Stop thinking about how you’re going to score some more coke Tracy! Oh Tracy- we said if you were clean for 6 months we”‘d get you a pet- that’s it- Llola is going back to the farm!! It’s sad- colorful, but sad. When it’s bad, it’s REALLY bad! You excelled yourself today. I was in the giggles. Hideous all of them except the bomber jacket, style wise not bad. The first pic is champion. Those trousers, seriously!!! Llamas would look fabulous in the fringed hoof covers! Maybe trimmed a bit for goats even. Oh I’m getting a flouncy llama strut picture in my head! I think you could dust the floors with those shoes. And here I have been wondering if making a maxi dress out of a Chevron print would be too “LOUD” on me…. Then I take a look at the 5th photo, the blue print dresses… My cats would love their shoes! I think it just needs a little breakup. Just a little solid to interact with the chevron- I like it! Quite disturbing! Evil scientist craft time! Ugh. All so, so, so terrible. That color of denim gives me the creeps. Was this all just a junior high recycle project or a 4H session gone bad? Imagine actually buying these clothes to impress folks at the country club or wander around St Tropez? 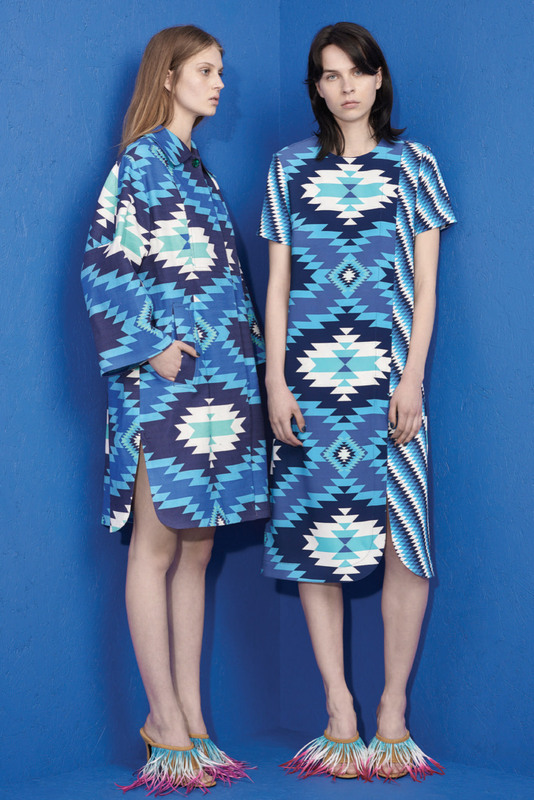 The two blue dresses are nice copies of authentic Pendleton wool blanket designs…they must be nightgowns, no? Those are nightgowns my pups would like- they look toasty! I can deal with the shoes, visually, but with all that fringy stuff, I think they would be dangerous to walk in. I agree with meagermeadows – they look like llama hoof covers – which is enjoyable because I’ve always liked llamas. I guess it also explains the dress with tassels (llama blanket decor), the long gauchos (unrelated other South American cultural reference), and the pattern on the blue dresses (undefined cultural reference). If only llamas had modeled these- so much more cheerful! Y’know, I would pay money to see someone attempt wearing/walking/living like a normal human in those shoes. I would bet a podiatrist would too! Not the best trade ever! I see that Mum missed a trick. You can add a frill round the pockets to balance out the hem lengthening. Inspired huh? Walking in those shoes is clearly dangerous btw. You can break your ankles and end up having your feet attached backwards by ER staff mesmerised by the awfulness of your outfit. I thought the shoes were decorated with mutant caterpillars (a HS lab experiment gone wrong? ), but then I saw the ones with feathers…oh my! This collection is so ugly, it’s almost comical. If people think it’s exclusive enough, they’ll buy it, so the designer is probably laughing all the way to the bank. Thank you for my laugh of the day! And why would anyone put upholstery passementerie on flip flops? To make sure they trip? Imagine how those are when wet- like walking thru seaweed! First pic–I have hairy pancakes growing on my chests! And as for the llama sweatshirt, I think tees with words on them are not unlike vanity license plates. Maybe the words means something to you, but if you have to explain it to someone, they automatically lose their cool factor. Maybe there was more llama drama then we know about going on with those shoes. Buy alpaca- they avoid drama! Hilarious, as ever. Back to front feet, stolen souls (soles?) and braid on your bell bottoms. Ha ha ha.